The Samford University Athletics Department has announced the names of the six individuals who will make up the school’s Athletics Hall of Fame's inaugural class. Basketball coach and student-athlete Walter Barnes, track and field/cross-country standout Lauren Blankenship, football coach and player Bobby Bowden, football student-athlete Wally Burnham, football standout Cortland Finnegan and tennis star Charlie Owens make up the inaugural class. The hall of fame, located on the third floor of Pete Hanna Center, will be officially dedicated with a ribbon cutting April 19 at 9:30 a.m. 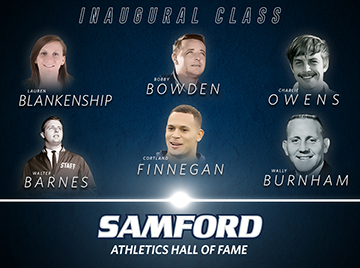 The class will be inducted May 6 with a reception at 5 p.m. in Hanna Center, followed by a dinner at 6:30 p.m. in Cooney Hall, home of Samford’s Brock School of Business.